It’s not just superheroes that have the monopoly on comic book origin stories. Now Keanu Reeves’ kinda-sorta-not-really ex-hitman John Wick is getting his own, in the form of a new comic series coming later this year. Although Dynamite first announced that Hollywood’s current favorite badass assassin would head to comics late last year, new details released today by the Hollywood Reporter reveal that Greg Pak—the writer behind Totally Awesome Hulk, and many more series—and artist Giovanni Valletta will use the series to flash back to Wick’s earliest days in his career as a hired killer. The series, which promises to be canonical with the two John Wick movies, will tell a new story while being intertwined with flashbacks to Wick’s origins, as well as details about the surprisingly wild mythology that punctuates the assassin underworld Wick retired from before the events of the films (something which will also be the subject of the in-development TV show). Presumably, there may or may not be a faithful dog involved at some point, if we’re staying true to the John Wick canon. There has to be one in some way, especially in his origin story, right? 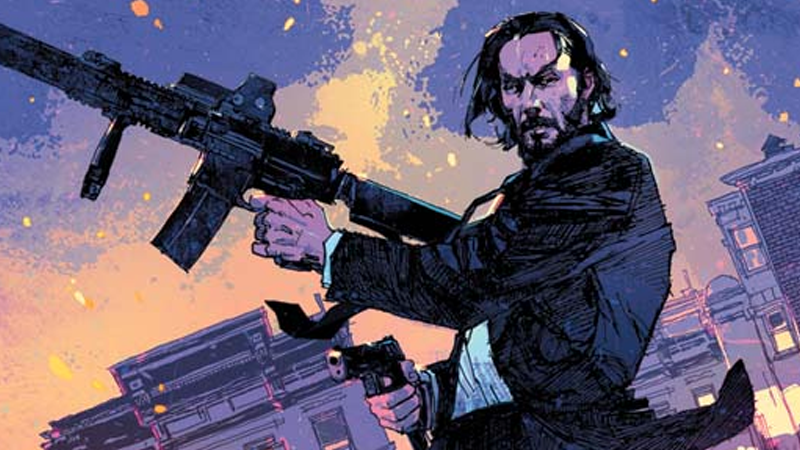 Dynamite’s ongoing John Wick series is set to begin this September.